How do I save/print/export or output a report to another format with Total Access Analyzer? – FMS, Inc. 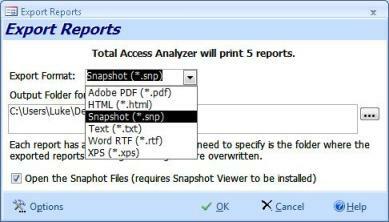 This feature was added in the X.8 version of Total Access Analyzer for Access 2003, 2002, and 2000, With the X.8 version, you can export reports to HTML, Snapshot, text, and RTF. The best way to get the information in the same format is to use the Snapshot Viewer for Microsoft Access that comes with Microsoft Office Service Packs. This is the easiest. You can also use a variety of other methods including the Options to Output reports to MS Word (Tools Menu | Office Links | Publish it with MS Word). You can also Export the report to a different format as well. To Export, Go to the File Menu and click on Export. When the dialog comes up, you can choose to Export to many different formats (The box that says "Save as Type"). Lastly, while viewing the report, go to the file Menu and click on the Send option. A dialog will show asking what format you want to send the file in. Choose the format you want (***NOTE that all formats may not work properly with our reports). After you click OK, your default mail browser shows with an attachment. Simply save the attachment as "[What you want to name the report]" or e-mail the attachment to yourself. These methods do not always work properly and some information may be missing or formatted incorrectly for how you want to view it. The formatting is due to the way that Microsoft handles the output of the fields or controls it finds. We have no control over this formatting or the output functionality since this is Microsoft Access functionality for outputting reports and not our own.